Smash your goals and make a statement in womens gym tops from the latest Superdry Sport collection. 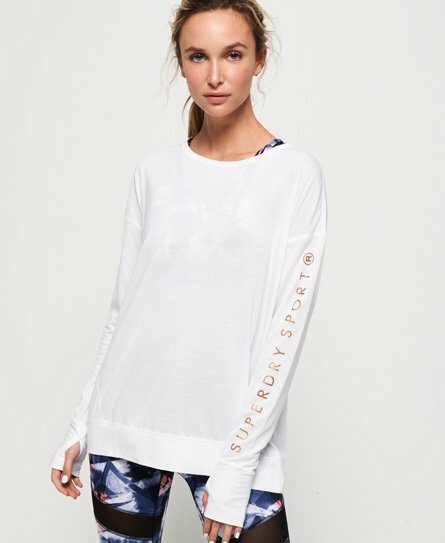 Choose from gym t-shirts, yoga tops, sports and track tops in on-trend cropped and loose fitting styles. A lightweight tank top is perfect to keep you cool during your next HIIT class thanks to breathable and moisture wicking fabrics. If you prefer Pilates or Yoga, our elastic vest top is for you. Loose fitting, with dropped style arm holes and a delicate T-bar back design, this sports top allows a full range of movements. Discover our full range of womens gym tops below.